Rob Morrow is a Partner of Table Rock Capital; and former Group Executive Vice President and Head of Asia Wholesale Banking, Bank of America. He wrote this about India Business Checklists. India has long been viewed as a country rich in economic opportunity with vast rewards available to those capable of navigating its complex and often enigmatic cultural, political, regulatory and infrastructural challenges. Since the initiation of market and economic reforms in the mid-1980s, India has experienced rapid growth in GDP, productivity, consumer spending and capital investment (both domestic and foreign). As India competes for greater economic prominence on the world stage, it comes to the task well-equipped. Blessed with a large and growing consumer population, a democratic political system, a significant English language skill base and highly developed legal, accounting and banking regimes, India possesses many enviable competitive advantages. Not surprisingly, India’s economic boom has been accompanied by foreign investors’ heightened interest. Yet, the challenges of converting potential success into a reality have never been more pronounced. This is particularly true for foreign enterprises seeking entry into India for the first time. It has been observed that the decision to do business in India is relatively easy… successfully doing so is the hard part. For those who have experienced this disconnection first hand or seek to minimize its pitfalls, this book is a must. It identifies with great clarity an array of potential risks and barriers to entry ranging from seemingly mundane logistical issues to important cultural practices to legal pitfalls, banking regulations, taxation and beyond. The reader need only glance through the table of contents to recognize that India’s many treasures will not easily be unlocked and that India Business Checklists is an essential starting point for a successful journey. The book’s style and format are worthy of particular note. Rupa Bose has taken an immensely complex set of issues regarding India’s business landscape and forged them into a practical, crisp and user friendly text. 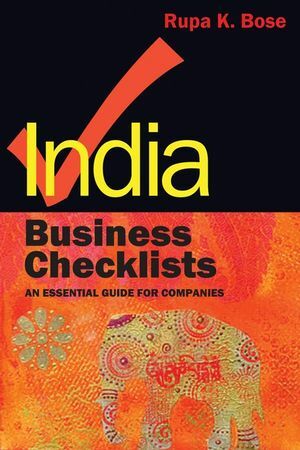 Perhaps most importantly India Business Checklists offers a balanced and even-handed assessment of India’s often elusive commercial practices. The author has brought a measured, well-researched and thoughtful approach in a highly readable work that makes great strides toward demystifying entry into India’s fast moving economic game.